Vanuatu is a collection of over 80 tropical islands situated in the South Pacific around 1000 miles east of Australia. Polynesian peoples first became established here thousands of years ago, arriving on small boats to find rich lands with no large animals (though the native bats known as "flying foxes" are said to seem quite large when they swoop by). The Spanish were the first Europeans to visit, in the 1600s; the islands were later called the New Hebrides by their French and English colonizers. 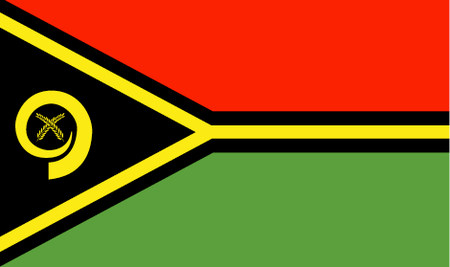 The Republic of Vanuatu was only established in 1980, when France and England gave over sovereignty to the people. The larger islands are mountainous and all are heavily forested; there are also some active volcanoes within the archipelago, which extends over some 4700 square miles. The climate of Vanuatu is typical for the South Pacific, with a warm, rainy season from late November to early May; this is also hurricane season, and as recently as 2015 a major storm caused widespread damage and some fatalities. During the dry season, though, Vanuatu is a vacationer's paradise, with such attractions as scuba and snorkeling around coral reefs and hiking through the jungle. There is even golf to be had here, starting with a full-sized championship layout at Port Vila Golf and Country Club; this high-end facility hosts the Vanuatu Open, and features spectacular views of Mele Bay. Also located around the capital of Port Vila are Le Meridien Resort and Casino, which offers 12 holes, and Warwick Le Lagon Resort and Spa, which offers 9. Finally, there is on the island of Espiritu Santo a 9-holer at Luganville.